RV equipment and appliances are an important part of any RV adventure. If you don't have the right equipment or appliances, your camping vacation could turn out to be a lot of work. Here we will go over some of the available RV equipment options that may give you the vacation you are looking for. Most campgrounds have an electric hook-up at a majority of the campsites; this will provide you with a supply of electricity to power your RV. Here is a list of modern convenience items you will be able to use if you have an electric supply source, as well as links to online retailers where you can purchase them. You may also be able to find items in local hardware stores, outdoor equipment stores and RV dealers. Air conditioner: While most RVs come with a built-in air conditioner, these units sometimes break and need to be replaced. Having a fully-functional air conditioner can mean the difference between a pleasant vacation and a terrible one. Heating units: If you plan to travel during the winter, you will need an RV heater or furnace. You can have an electric or gas heater installed or use a space heater that is rated as safe for use in an RV. Be sure to install a carbon monoxide detector if you use a gas heat source. Kitchen small appliances: With everything from ice makers to microwave ovens available for RVs, you can enjoy just about every comfort of your home kitchen while you are on the road. Navigation system: A navigation system can help you plan travel routes and locate campgrounds and attractions. High end RV systems may include 3-D camera views that allow you to see beside and behind your RV as you are driving and trying to park. Power cords: Heavy duty, exterior-quality power cords are an absolute necessity if you want to be able to use electronic devices at your campsite. Stove: Most RVs have built-in stove units or separate cooktops and ovens. These items may need to be replaced over time. Washer and dryer: With an RV washer and dryer, you can wash and dry your clothes during your vacation without having to find a coin operated laundry, or worse yet, having to wait until you get home to do them. Water heater: This is a wonderful option. With hot water in your RV, you will no longer have to go to the public shower to clean yourself, your dishes and your clothes. Water softener: A portable water softener will ensure that you have quality soft water in your RV. A good softener will increase the life of the plumbing and water heater by removing many of the impurities from the water. If you plan to spend a good bit of time on the road, you may want to invest in power generating equipment so that you don't have to rely completely on electrical hookups at campgrounds for all of your power needs. Consider investing in your own generator and/or equipment that allows you to harness energy from wind or the sun. Here are a few items you may want to consider, as well as online resources for finding them. Local home improvement warehouses and energy supply retailers may also have items that meet your needs. Generator: A portable gasoline or diesel-powered generator can make it possible for you to power your RV when camping off the beaten path regardless of weather conditions. 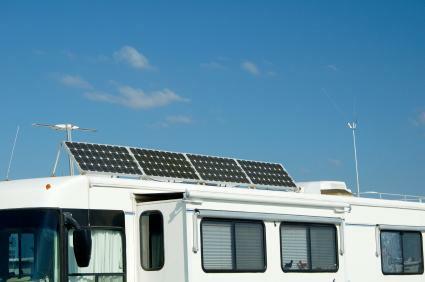 Solar panels: Installing RV solar panels can allow you to harness energy from the sun to use for some of your recreational vehicle's power needs. Wind turbine: A wind turbine can provide you with the capability of harnessing power from wind, a free and renewable source of energy that is abundant in many areas. You may want to consider building your own wind turbine rather than purchasing one. When you are camping you will probably spend a good amount of time outside of your RV. Here are some ideas for outdoor RV equipment that may be useful to you on your next camping trip, along with suggestions for where you can find each item. Of course, local camping supply stores and outdoor supply retailers may also carry these products. Grill: While many campgrounds provide grills, there are plenty that don't. If you take along your own small gas or charcoal grill when you go camping, you'll always be able to enjoy the fun of preparing meals in the great outdoors. Retractable awning: A good awning can be one of the best investments you make for your RV. Crank awnings are the least expensive, but are much more complicated to operate than automatic ones. Screen room: Bugs can ruin a pleasant vacation. A portable screen room can be your answer to those pesky pests, offering you a safe haven from bugs and a place to escape from direct sun. There are so many different types of equipment and appliance options available to RV enthusiasts. The options presented here are only a few of the many items you may want to consider. Some items are necessities while others are luxuries. Consider how often you go camping, how long you stay on the road and what you like to do during your trips when deciding what to purchase. Start with the things that you really need and will use frequently, adding luxury items as your budget allows and replacing worn out items as necessary.